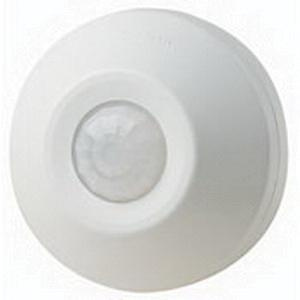 Leviton ODC Series Commercial-grade line voltage occupancy sensor in white color, features passive infrared technology. It has sensing distance of 530-Sq-ft and 360-degree viewing angle. Sensor with switching relay, requires 277-Volt AC voltage for operation. It is suitable for storage areas, small bathrooms, copy rooms, mop/sink closets or small spaces without wall switches. Sensor measures 4.3-Inch Dia x 2.15-Inch.